Property Location With a stay at Hotel Valencia Riverwalk, you'll be centrally located in San Antonio, steps from San Antonio Majestic Theater and minutes from River Walk. This 4-star hotel is within close proximity of Main Plaza and Cathedral of San Fernando. Rooms Make yourself at home in one of the 213 air-conditioned rooms featuring minibars and flat-screen televisions. Complimentary wireless Internet access is available to keep you connected. Bathrooms have designer toiletries and hair dryers. Conveniences include phones, as well as desks and coffee/tea makers. Amenities Take advantage of recreation opportunities such as a health club, or other amenities including complimentary wireless Internet access and concierge services. Additional amenities at this hotel include babysitting/childcare (surcharge) and a television in a common area. Dining Enjoy a meal at a restaurant or in a coffee shop/café. Or stay in and take advantage of the hotel's 24-hour room service. Quench your thirst with your favorite drink at a bar/lounge. Business, Other Amenities Featured amenities include a business center, limo/town car service, and express check-out. Event facilities at this hotel consist of conference space and meeting rooms. 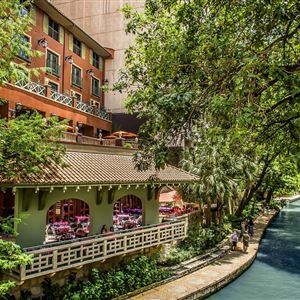 With a stay at Hotel Valencia Riverwalk, you'll be centrally located in San Antonio, steps from San Antonio Majestic Theater and minutes from River Walk. This 4-star hotel is within close proximity of Main Plaza and Cathedral of San Fernando. Make yourself at home in one of the 213 air-conditioned rooms featuring minibars and flat-screen televisions. Complimentary wireless Internet access is available to keep you connected. Bathrooms have designer toiletries and hair dryers. Conveniences include phones, as well as desks and coffee/tea makers. Take advantage of recreation opportunities such as a health club, or other amenities including complimentary wireless Internet access and concierge services. Additional amenities at this hotel include babysitting/childcare (surcharge) and a television in a common area.